Destin beach resort condo for sale at The Islander, a gulf-front family development on the Florida Emerald Coast on Holiday Isle. 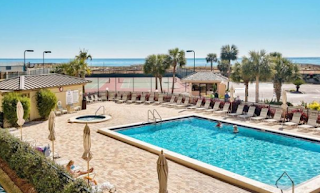 The amenities at this popular condominium complex include free beach service, two pool, tennis courts, a social room, an exercise facility, hot tub, outdoor BBQ/grills & more. This resort residence has 2-BRs, 2-BAs and can accommodate 6 people - making it a good second home and/or real estate investment property. This beach resort has been completely remodeled and this condominium home has been renovated as well. Destin Florida is a Gulf Coast community on the Florida Panhandle is located on a peninsula separating the Gulf of Mexico from Choctawhatchee Bay and has subtropical weather. The peninsula was originally a barrier island. Hurricanes and sea level changes gradually connected it to the mainland; however, in the 1940s it technically became an island again with the completion of the Choctawhatchee-West Bay Canal. There are real estate opportunities for those looking to own a piece of paradise - there a Destin Florida homes for sale from beachfront houses to back-water homes on deep water to weekend cottages.